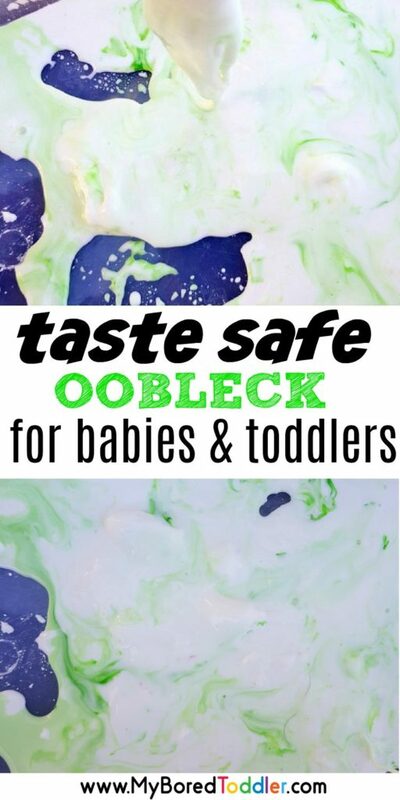 I’m super excited to show you how to make taste safe Oobleck today – this is perfect for babies and toddlers, but older children will love it too. 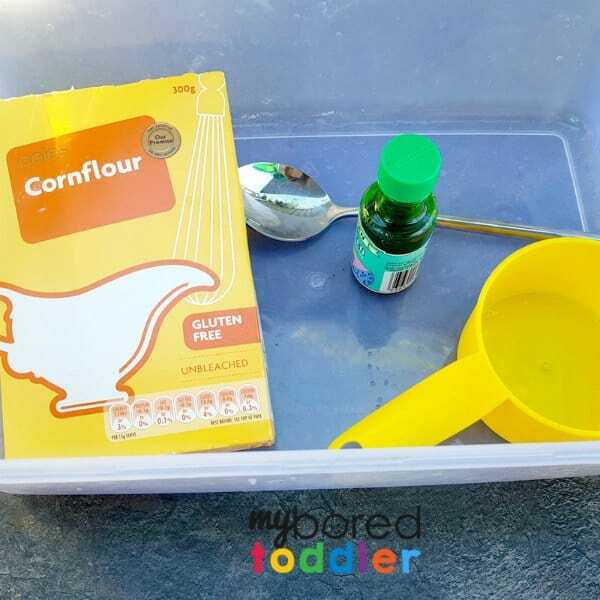 It’s so easy to make, the ingredients cost almost nothing and it’s a great messy and sensory play activity. 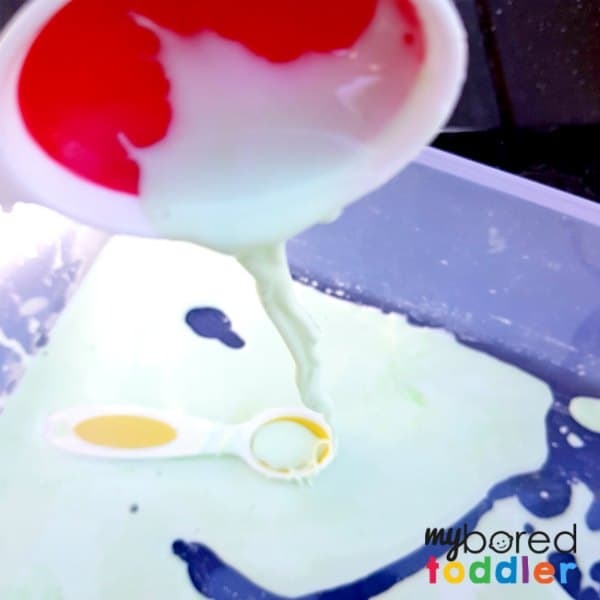 Taste Safe Oobleck is our Day 2 challenge for those of you taking part in our 5 Day Messy Play Challenge (it’s free and if you would like to join in you can do that HERE). If you missed yesterday’s challenge you can find our Messy Play with Shaving Cream activity HERE. Oobleck is something I remember making back at University when I was studying to be a teacher. It was part of a science lesson and it’s one of those recipes that’s remained a favorite. 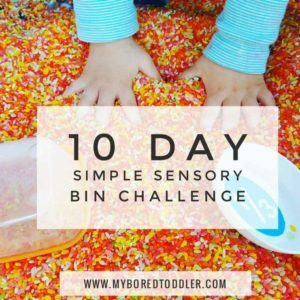 As a teacher and a parent, an activity that’s low cost and ticks the boxes for sensory, messy and science related play is one that I like! What do you need to make taste safe oobleck? 2 cups of corn starch/corn flour – this is the same thing, it has different names in different countries. 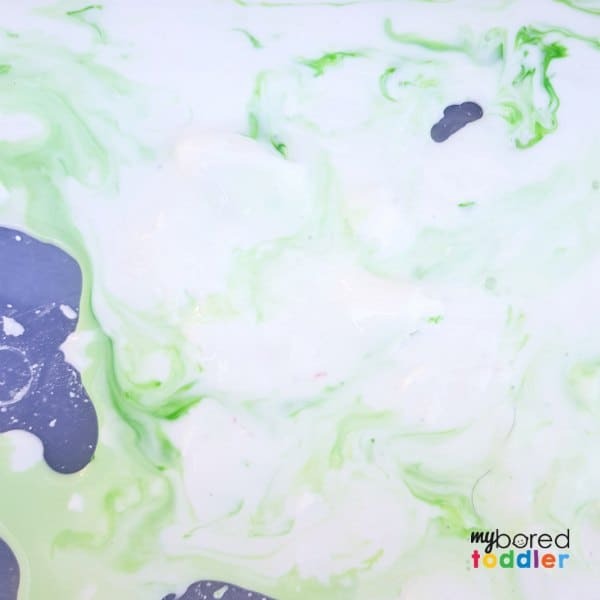 Oobleck is naturally taste safe and with the slime craze going around, this is a nice alternative for the younger children. When you know that there’s a good chance at least some of this will go in their mouth you want to make sure it’s safe. 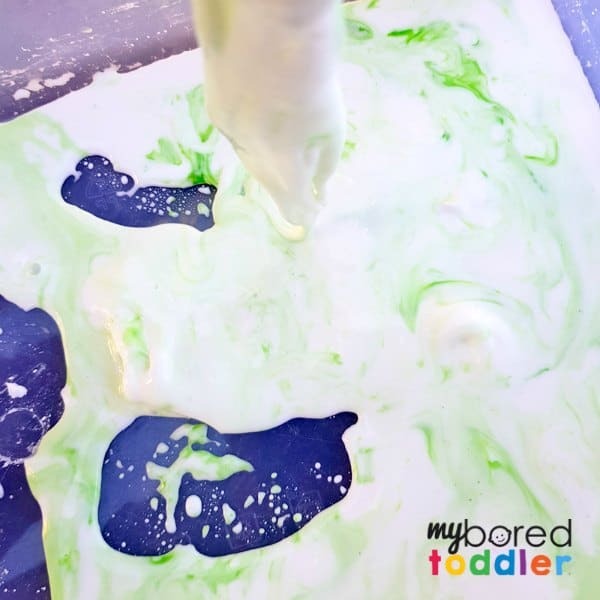 This is such an easy to make oobleck recipe – you really can’t go wrong! Add 1 cup of water and 1 drop of food coloring. Mix well. It doesn’t matter if the food coloring doesn’t make a solid color – it actually looks good if it’s a bit swirly! You’ll notice that the consistency is a bit weird! If you’ve never made it before you often don’t know what to expect, but it should resemble quite a solid consistency in the bowl. When you pick it up or scoop it up it will get softer and turn into a runny liquid. You’ll notice that the more you stir it, the harder it will get and when you leave it alone it gets runnier again – it’s fascinating! 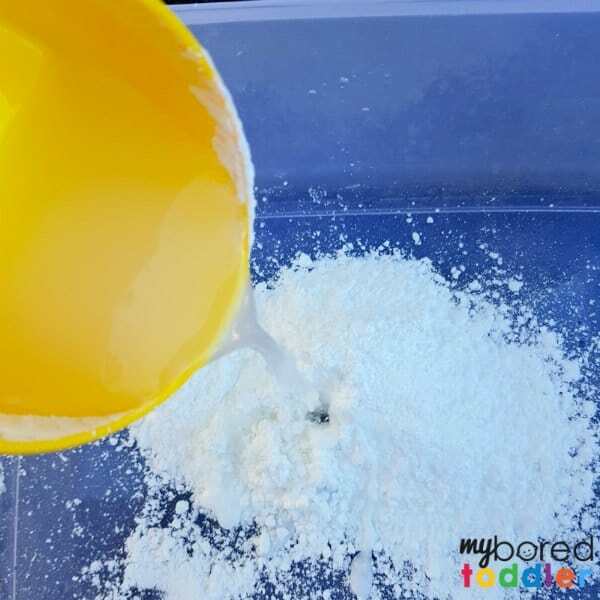 If you’re interested in the science behind oobleck this article explains it better than I can! While you can keep oobleck in the fridge for a little while, I recommend making a fresh batch each time. It’s quick and easy. If you make your oobleck I would love to see some photos! 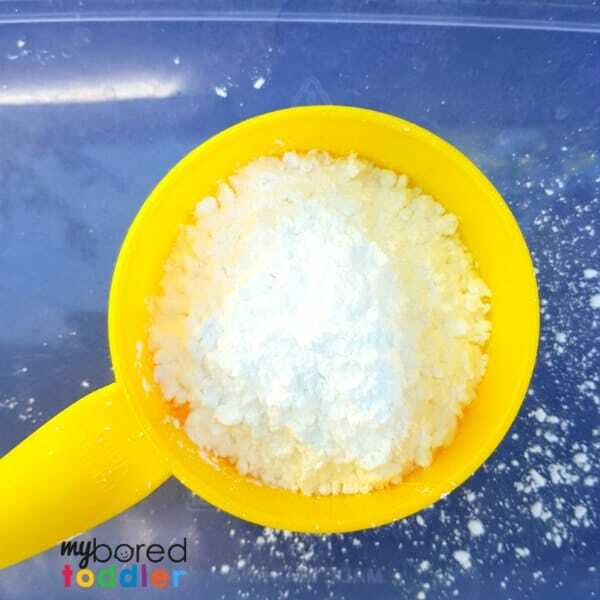 Share your pictures in our Facebook group or on Instagram (use #MyBoredToddler and tag @myboredtoddler). I’ll be reposting some of my favorite photos!